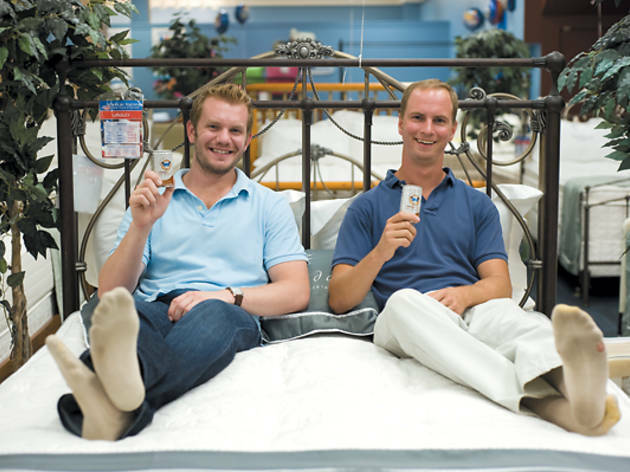 Two local entrepreneurs promise a good night's sleep in a five-ounce can. Chuck Hamman and Eli Galayda know firsthand how elusive restful sleep can be. The Lakeview guys behind the new herbal sleep-aid drink Sleepyhead met as political-science students at the University of Dayton and bonded, in part, over their common struggle to get shut-eye. “We talked a lot about how much time we’ve killed just staring at the ceiling,” says Hamman, 28, who adds he has difficulty catching z’s two or three nights a week. The 5.5-ounce can branded with a sheep wearing a sleep mask promises to promote the onset of snoozing in 15 to 30 minutes. Skeptical, I went on a Sleepyhead crawl with Hamman and Galayda to see if their drink would indeed put me out. 8:10pm Like good Lakeview twentysomethings, Hamman and Galayda brought their own plastic shot cups to the Walgreens at 2317 North Clark Street so we can swig Sleepyhead. The drink is milky and hazel-colored, like a bottled Starbucks Frappuccino, and has a fake, chemically caramel flavor. “We’re playing off the old adage of having a warm cup of milk before bed,” Hamman says, “except warm milk is gross, so we wanted it to taste better.” Honestly, I’d prefer the warm milk. 8:39pm “I tried it about a week ago,” says 7-Eleven clerk Michelle Gutierrez, 37. “I usually wake up every couple of hours, but I slept through the night.” We down shots. A few minutes later, I become weirdly conscious of my body’s heft. 8:50pm I’m rubbing my eyes and yawning deeply. An American Mattress store we pass looks like heaven. 8:55pm Final stop: Milk & More grocery at 702 West Diversey Avenue. Another gulp. One can is the recommended dosage of Sleepyhead; I’ve ingested a can and a half. My eyelids are leaden. “Sleep well,” Hamman and Galayda say in harmony. I lurch sluggishly toward home. 10:12pm I make a beeline for my bed and it’s lights out. Sleep comes effortlessly—surprising, considering I usually don’t doze until after 1am.The next morning I awake with ease. All in all, it’s the deepest, most satisfying sleep I’ve had in a long time. Find stores that stock Sleepyhead at drinksleepyhead.com/retailers.